Paris, collection of Jules Burat (1807-1885, journalist and professor at the Conservatoire des arts et métiers). His sale, Paris, April 28, 1885, lot 207: “WATTEAU (ANTOINE) / (PENDANT DU PRÉCEDENT) . . . Scapin berger. Couché sur le flanc, vêtu de noir, il tient un bâton de berger et garde des vaches que l’on aperçoit au second plan. Bois. Haut., 12 cent., larg. 23 cent.” The painting and its pendant sold together for 5,000 francs according to Adhémar. Paris, private collection. Sale, Paris, Hôtel Drouot-Montaigne, December 12, 1989, lot 13: “Entourage de Antoine WATTEAU (École française vers 1730) / Le mezzetin berger / Panneau de chêne (une planche) non parqueté / 13 x 23 cm / 60 000/80 000 FF / Provenance: Collection Burat, Paris, dès 1860; Vente Burat, Paris, galerie Georges Petit, 28-29 avril 1885, no 206 (Watteau); Collection G. W., Londres, en 1959; Vente G. Renand, 3e partie, Paris, Paris, Drouot Montaigne (Compagnie des Commissaires-Priseurs de Paris), 31 mai 1988, no 18 reproduit; Acquis à la vente par l’actuel propriétaire. Expositions: Tableaux de l’École française, principalement du XVIIIe siècle, Paris, 1860, no 432; Pélerinage à Watteau, Paris, Hôtel de la Monnaie 1977, no 194, reproduit (École française du XVIIIe siècle). Bibliographie: Horsin Déon, «La Collection Burat», L’artiste, 1861, p. 247; R. Huyghe et H. Adhémar, Watteau, sa vie et son oeuvre, Paris, 1950, no 309 (les auteurs refusent l’attribution à Watteau); J. Mathey, Antoine Watteau, Peintures Réapparues, Paris, 1959, pp. 25 et 73, no 9, reproduit fig. 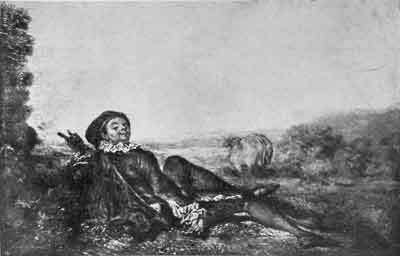 9 (Watteau); E. Camesasca et preface de P. Rosenberg, Tout l’oeuvre peint de Watteau, Paris, 2o edition, 1982, p. 125, sous la letrre S (les auteurs refusent l’attribution à Watteau). Notre tableau avait à la vente Burat un pendant (Scapin berger), voir Mathey, opus cité supra, reproduit fig. 8; J. Mathey signale des répliques pour ces deux tableaux dans la collection Brown-Bovery à Baden.” Bought in. Paris, Galerie Martinet, Collections d’amateurs (1860), cat. 433 (as by Watteau, Scapin berger, lent by M. Burat). London, Wildenstein, Watteau & His Contemporaries (1930), cat. 31 (as Watteau, The Black Shepherd). London, Wildenstein, The French XVIIIth Century Interior (1951) (as by Watteau, Black Shepherd, from Wildenstein). Paris, Hôtel de la Monnaie, Pèlerinage (1977), cat. 194 (as by the “École française du XVIIIe siècle,” Le Berger couché, lent by a private collector). Déon, “Cabinets d’amateurs” (1861), 247. Adhémar, Watteau (1950), cat. 309. “Courtly Splendour,” London Illustrated News (March 10, 1951), 381. Mathey, Watteau, peintures réapparues (1959), 25, 66, no. 9. Eideberg, “The Young Lancret and Watteau” (2015). Until now the earliest known provenance for this painting and its pendant had been the Burat sale in 1885. The recent discovery of the paintings in the Gélis sale of 1875 allows us to push their provenance in Paris ten years earlier. Moreover, we posit that they were in Paris still six years earlier at the Dulong sale in 1869, where they were sold with minimal description and no measurements. 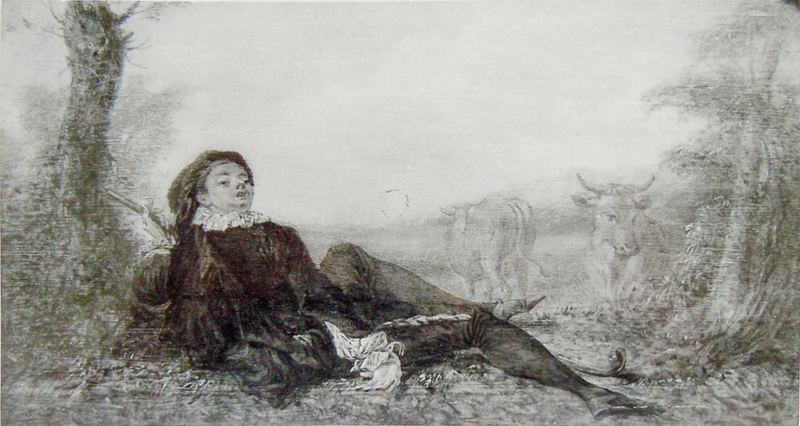 There are few alternate possibilities in the oeuvre of Watteau and his school that are pendants, each of which features just one resting shepherd. Our association of the Berger rose with lot 63 rather than lot 62 (described as “Berger au Repos”) is for convenience but is admittedly arbitrary. There has been considerable confusion about the identity of the commedia dell’arte character in this painting. At the Gélis and Burat sales, the man in this painting was described as Scapin, an actor normally recognizable by his green- or blue-striped costume yet the costume in this painting is black with gray hose, a combination more appropriate to Scaramouche. Complicating matters further, in recent times this painting has wrongly been identified as “Mezzetin berger” or “Berger rose,” which are appellations appropriate to the pendant. 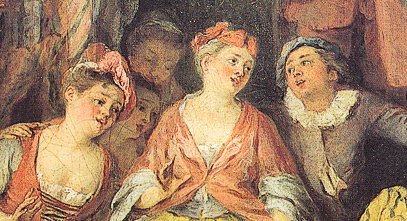 When in the Burat collection, this painting and its pendant, both thought to be by Watteau, were described by Déon as “gracieuses, fantaisies pleines d’expression et de poésie.” Whereas scholars such as Réau and Adhémar rejected the old attribution to Watteau, Wildenstein and Mathey unconvincingly tried to retain the idea that the picture was indeed by him. The more recent classification in 1988 and 1989 as “entourage de Watteau” is more reasonable, but the proposed date of c. 1730 is probably a decade too late. Nicolas Lancret, Berger noir (detail). Nicolas Lancret, Concert dans un parc (detail), oil on canvas. Whereabouts unknown. The attribution of the painting can be refined more precisely. The facial features of this man—his slightly parted lips, large eyes, pug nose, and flared nostrils—suggest, instead, that this painting was executed by the young Lancret in the late 1710s. Comparison with some of his earliest works, such as Concert dans un parc, show that these features are analogous. Paris, collection of Camille Groult (1837-1908). This provenance was claimed by Wildenstein. London, Galerie George Wildenstein, by 1920 when the picture was sold to Sidney William Brown (1865-1941, engineering industrialist) and his wife Jenny Sulzer (1871-1968). Baden, Brown Bovery collection. By descent to their sons, and donated in 1987 as part of the Stiftung Langmatt Sidney und Jenny Brown. Courthion, “La Collection Brown-Bovery” (1926), 27-29. Mathey, Watteau, peintures réapparues (1959), under no. 8. 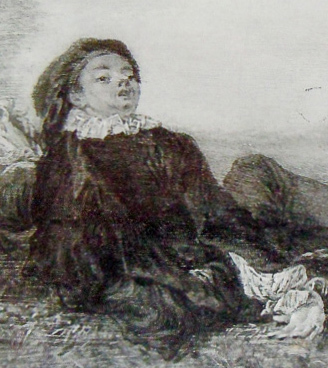 Macchia and Montagni, L’opera completa di Watteau (1968), under cat. 2o-S.
Presiwerk-Lösel, Ein Haus für Impressionisten (2001), cat. 147. While the early provenance of the Baden museum’s painting is largely undocumented, it seems likely that it and its pendant were attributed to Watteau himself. Certainly this was the way they presented in the 1920s and still in the 1950s. Curiously, during all that time there was no mention that they were copies of the pictures that had been in the Burat collection. Rather, Wildenstein presented them as though they were the very paintings that had been in the Burat collection and then in the Groult collection. Mathey appears to have been the first to publicly recognize that they were but copies. He retained the old attribution of the ex-Burat paintings to Watteau, but it would seem that he made no such claim for these copies. Presently the museum classifies them as just French works from the first half of the eighteenth century. Unidentified artist, Berger noir (copy 1). The Baden pendants are not exact replicas of their models. In the case of the Berger noir, the tree trunk at the left side was eliminated and replaced by a generalized sense of foliage. Likewise, the trees at the right side of the composition were eliminated and the cows in the foreground were pushed further back. Because of the changed proportions of the picture, the area devoted to sky has been increased. These changes can be read as simplifications of the original composition. The important question remaining, then, is who executed the copies. Although I believe that the ex-Burat picture was painted by the young Lancret, it is less certain that he also painted this version. Judging from photographs, there seems to be a slight but significant difference in the rendering of the faces and the drapery—enough to suggest that the Baden paintings may be by a different hand.